To supplement the limited financial support he receives from his parents, begins working as a cartoonist for Bertoldo, a twice-weekly humor newspaper; first cartoon published October 27. He soon becomes one of the paper’s most popular and recognizable artists. The remunerative Bertoldo work begins to interfere with his Politecnico studies. “Panorami di Steinberg,” Bertoldo, February 11, 1938. Steinberg at his drawing table in his room above the Bar Il Grillo, Milan, c. 1937. Saul Steinberg Papers, Beinecke Rare Book and Manuscript Library, Yale University. 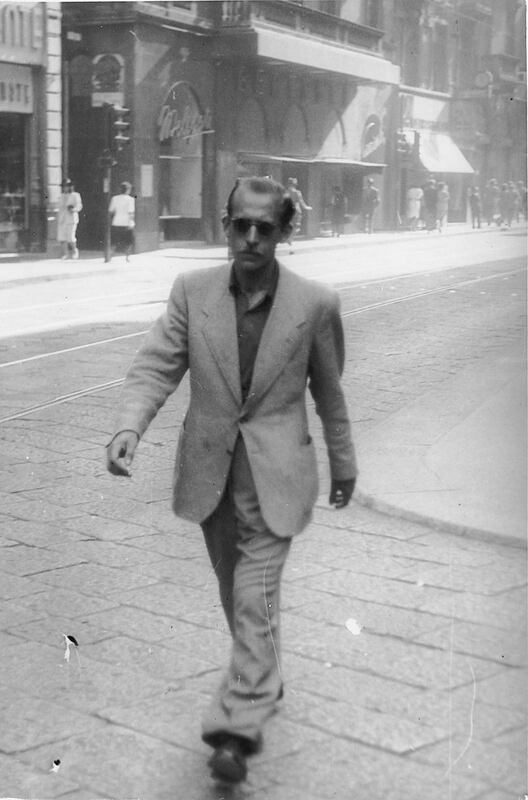 Steinberg in Milan, 1930s. Saul Steinberg Papers, Beinecke Rare Book and Manuscript Library, Yale University.